Home Brands and Products Kjaer Weis Abundance Cream Blush. Lilah B. Beauty Bronzer, Concealer and Brush. As mentioned in previous posts, I have been making a conscious effort to be more selective with regards to my makeup purchases. However, when a cosmetics brand you have been lusting after goes on sale, even the most resolute mind will not be able to resist the lure. So when Lilah B. 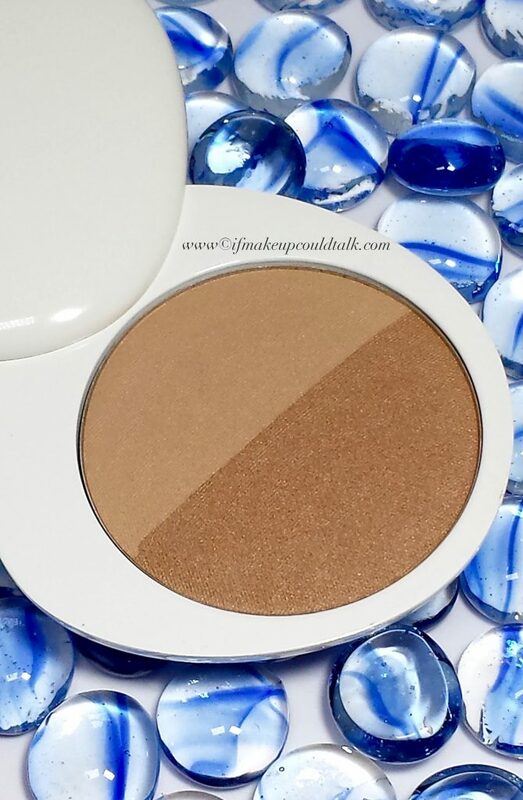 Beauty Bronzer ($42 USD/ 9g. ), Concealer ($44 USD/ 3.3g. ), and Bronzer Brush #2 ($42 USD) prices were slashed almost 60% off, you better believe I happily jumped on that opportunity. Will this freshly mint brand live up to my expectations or will it be just another pretty face in the crowd ? You’ll see. Lilah B. Beauty Bronzer, Concealer and Brush packaging. Lilah B. Beauty Bronzer and Concealer packaging. Lilah B. Beauty Concealer and Bronzer packaging–no mirror. Lilah B. Beauty Bronzer b. sun-kissed and Kjaer Weis Radiant highlighter compact (side note: the lilah b. lettering wore off after one week). 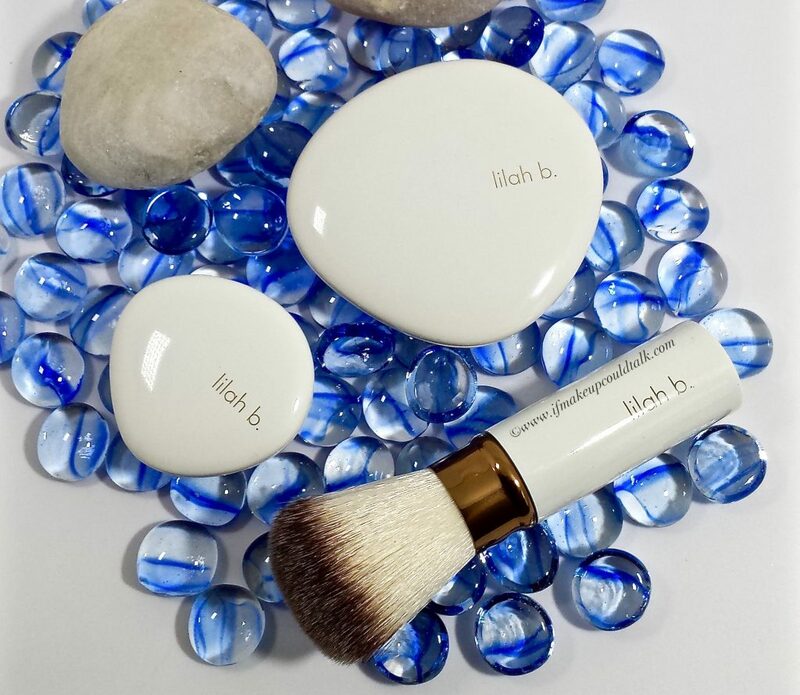 If you are a beauty lover, you will have surely heard of the Lilah B. Beauty brand. The company has become known for their minimalist, hefty, stone-like compact design. 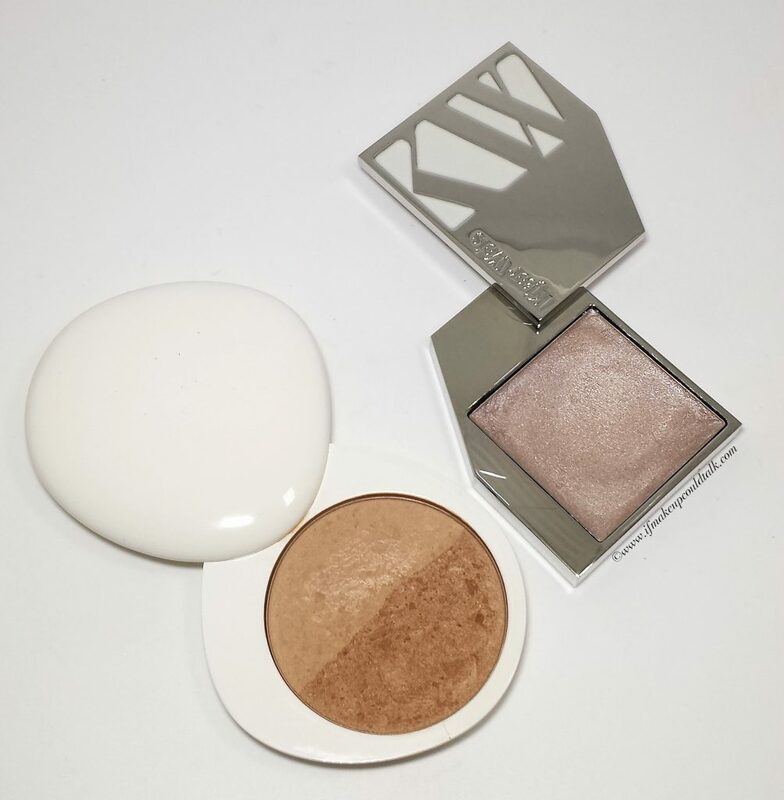 If you are familiar with the heavy Kjaer Weis packaging (reviewed here) these compacts are very much in the same league. The compacts are constructed entirely of metal and swivel open all around, to expose the product inside. 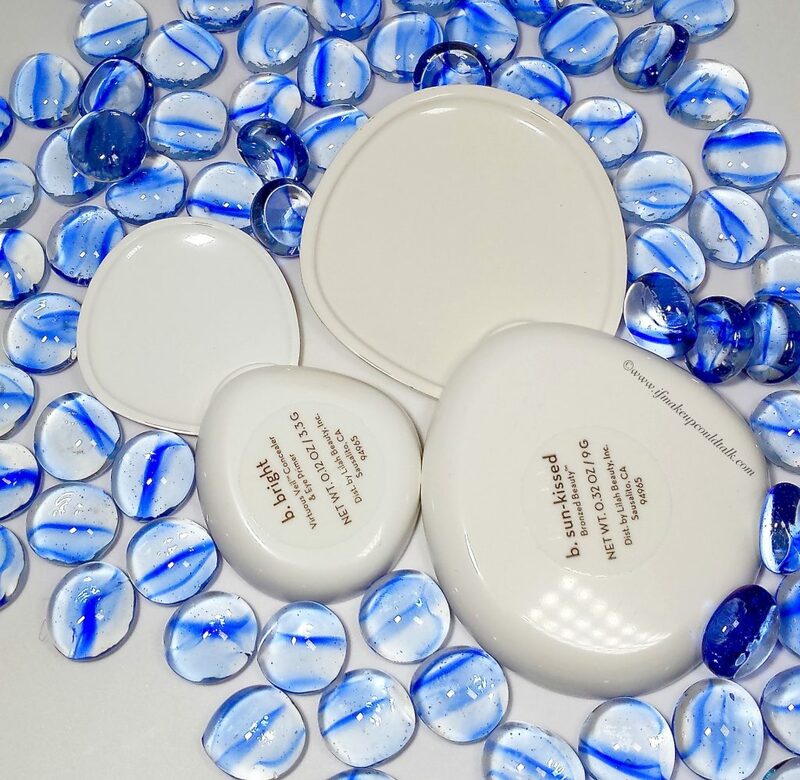 The rounded edges are smooth to the touch and do not poke the inside of a makeup bag–a feature I appreciate when it comes to compacts that are especially weighty. One aspect that surprised me was the lack of a mirror component. This omission is disappointing considering the cost of the products. Personally, I could overlook the added heft to my makeup bag if the compact contained a mirror for daily use. 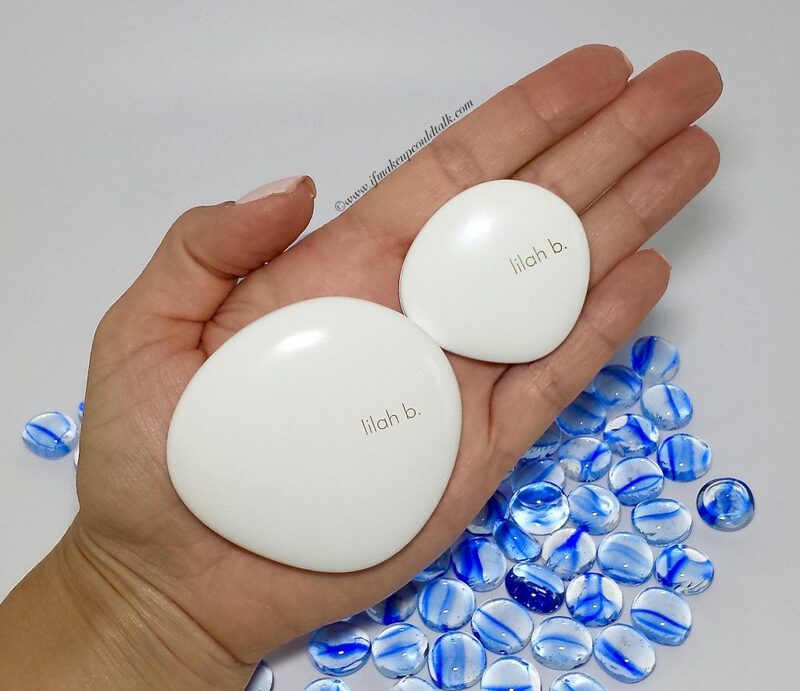 Unlike the Kjaer Weis line, the Lilah B. Beauty compacts are not refillable. Try as I might, I could not find a way to depot the pans from the compact without compromising the product. Lilah B. 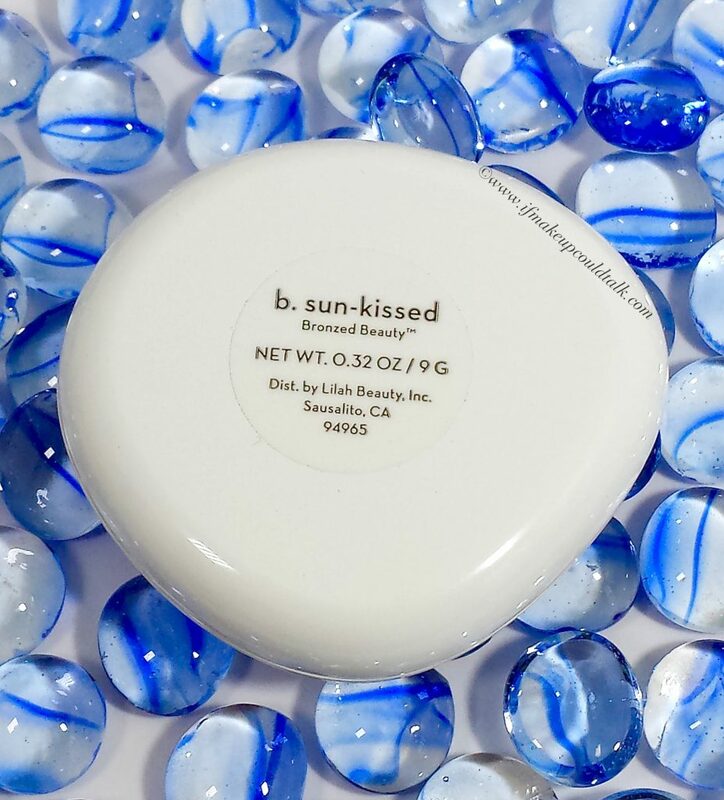 Beauty Bronzer b. sun-kissed. Lilah B. 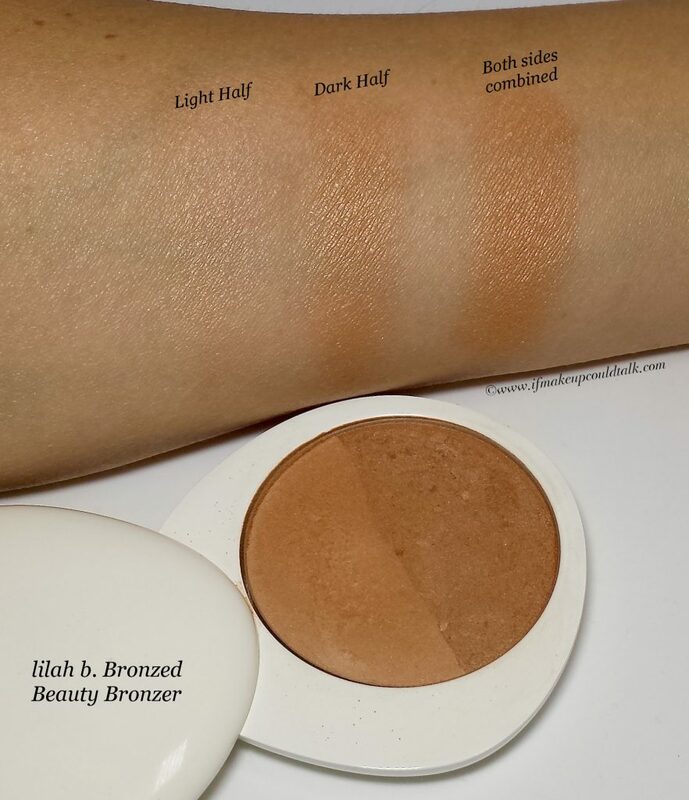 Beauty Bronzer b. sun-kissed swatch. Lilah B. Beauty Bronzer b. sun-kissed ingredient list. The b. sun-kissed Bronzer comes in only one shade. 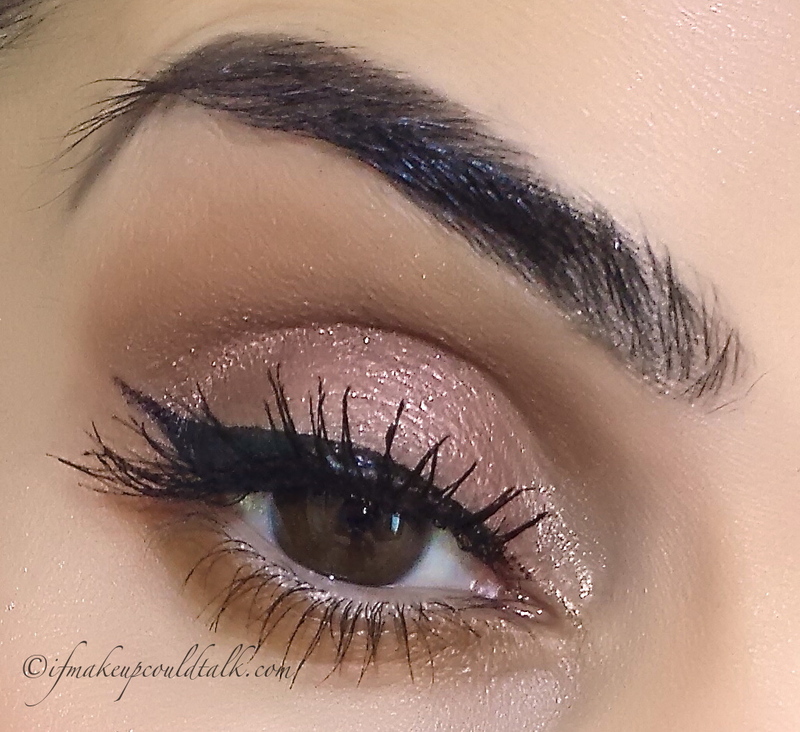 The bronzer is split into two halves; a 40% lighter side and a 60% darker side. I found the lighter shade to be pressed more firmly into the pan, which makes picking up product a bit more challenging. IMHO, this side did not add much in terms of color or sheen to the overall finish and oddly enough, with minimal use a hard-pan developed on the surface. The darker shade on the other hand, was smooth and provided most of the color payoff. In fact, when looking at my compact, I have a significant dip on the darker side compared to the lighter side. When the two colors are combined the resulting shade is a warm golden bronze, with a lovely satin finish. The color payoff is very pale and requires build-up on light-medium to medium skins. Deeper skins will find the color intensity less than stellar. In my experience, a stiffer, shorter bristled brush is the best tool for application. As mentioned, the lighter half is pressed quite firmly into the pan, therefore soft airy synthetic or animal hair brushes will be ineffective at picking up product. Despite all these factors, the end results are very flattering on my light olive complexion, but only when the right tool is utilized (see the brush section below). The color lasted well for a solid nine (9) hours with slight, even fading thereafter. Lilah B. Beauty b. bright Concealer and Eye Primer beautifully presented in a classic box. Lilah B. Beauty b. bright Concealer and Eye Primer. Lilah B. 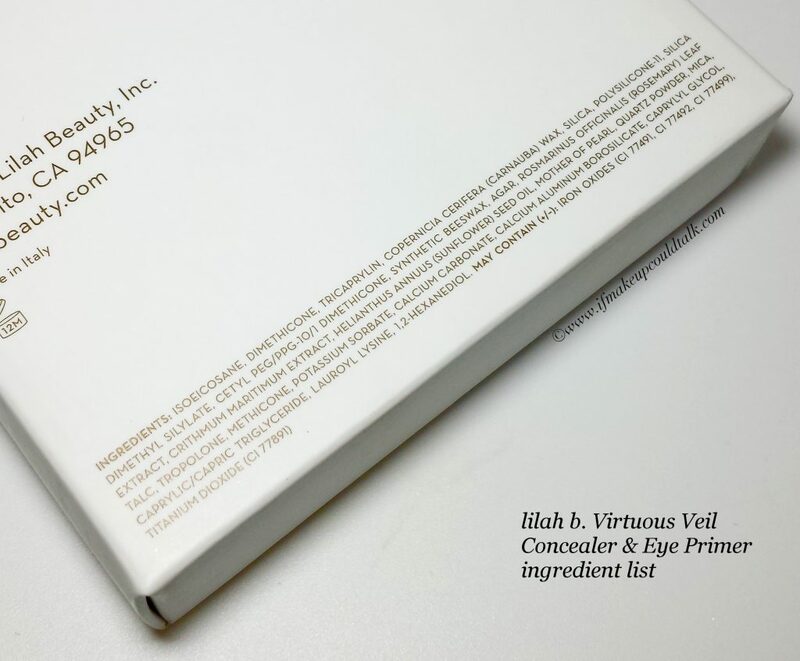 Beauty b. bright Virtuous Veil Concealer and Eye Primer ingredient list. 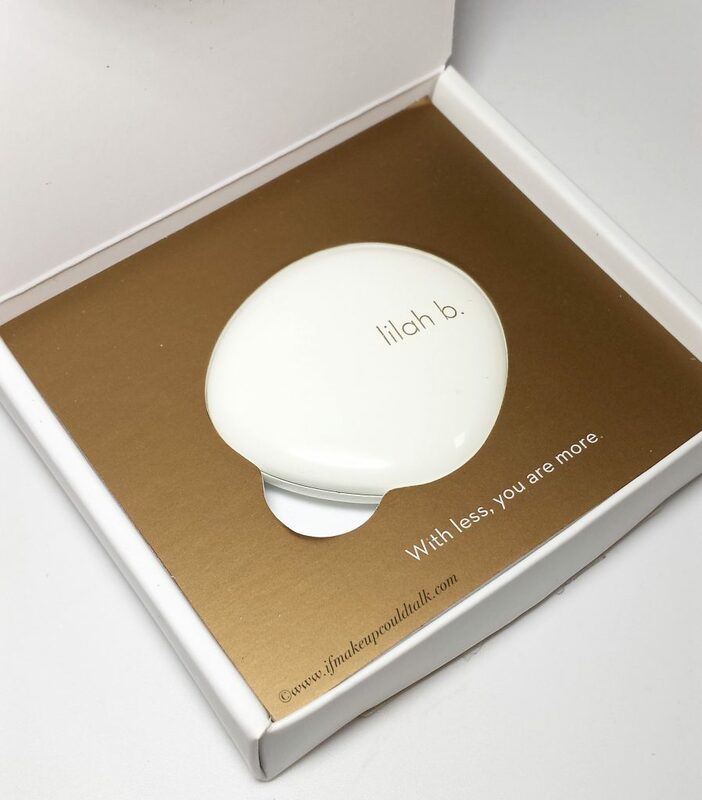 The Lilah B. Concealer and Eye Primer is one powerful little compact. Out of the three (3) shades offered [b. bright (light), b. radiant (medium), b.polished (dark)], b. bright was the shade that suited my complexion best. When placed on my green veining (next to my inner corners) the color leans more on the brighter yellow spectrum. However, when blended out (fingers work best) the color sheers out without sacrificing any brightening qualities or coverage. The texture of this concealer is absolutely silky smooth and hydrating–fantastic for maturing or dry, delicate skins. The coverage is quite evident in the above swatch, the green veining on my arm has been completely covered without looking caky. With that being said, it is highly advisable to use a light hand with this formula and to work in layers to build desired coverage. I can also confirm this concealer holds up surprisingly well for eyeglass wearers. Typically, I experience concealer break down under and around the nose pad area. 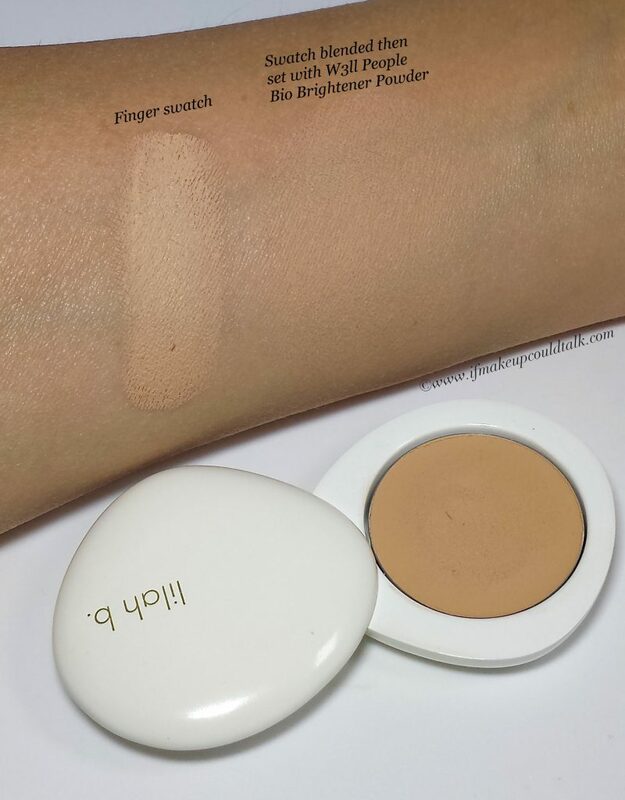 Lilah B. concealer lasts extremely well in that particular area when set with a powder. My preferred setting powder at the moment is the W3ll People Bio Brightening Powder. The ultra fine texture seems to meld well with the Lilah B. Concealer, to create a flawless finish. As the name states, this can also be used as an eye primer and I must say, it is fantastic for that purpose. 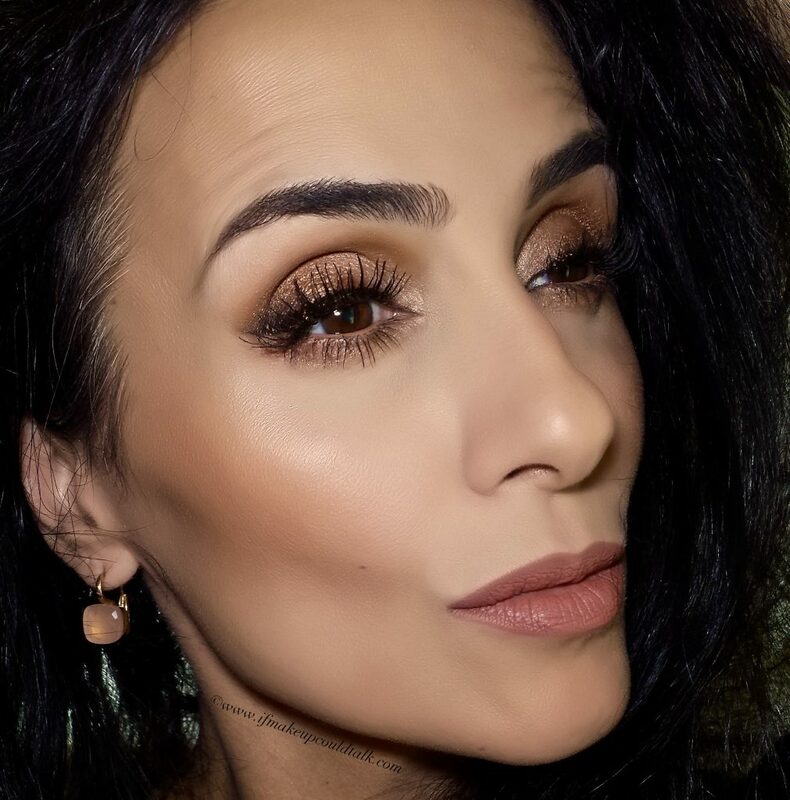 Applying two thin layers and then setting the primer with a flesh tone eyeshadow or with the W3ll People Bio Powder locks in the cream beautifully. The base provides just the right amount of coverage to even out my lid coloring, as well as, keeping eyeshadow in place all day without creasing or fading. Lilah B. Beauty Bronzer Brush. 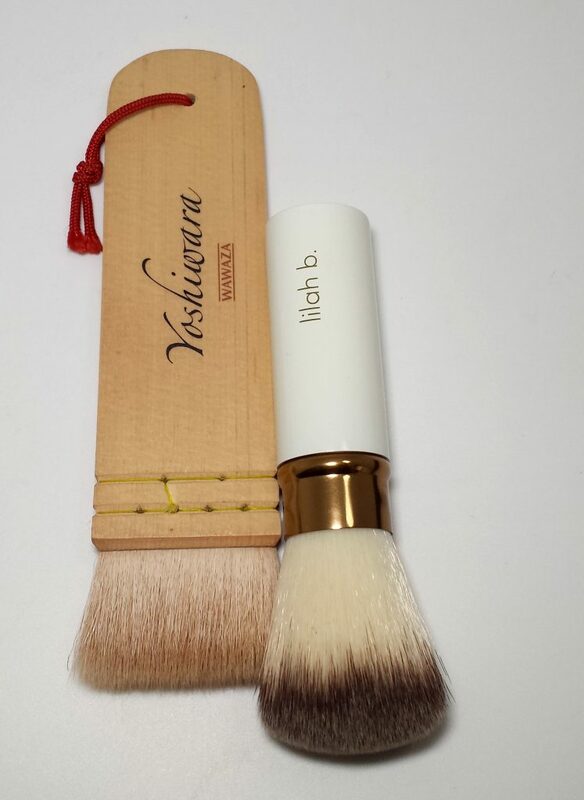 Wawaza Yoshiwara Japanese Makeup Brush vs. Lilah B. Bronzer Brush. 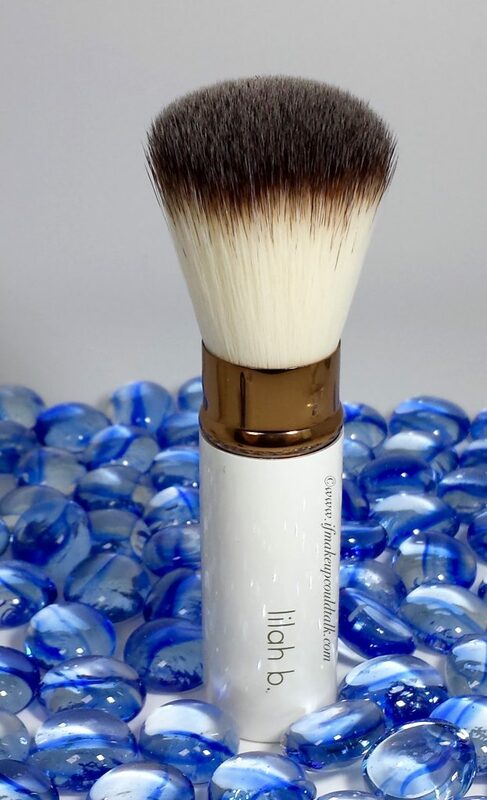 Without mincing words, the Lilah B. Bronzer Brush #2 is not the best tool for applying the Lilah B. Bronzer. The synthetic bristles are simply too long and the density is severely lacking for adequate product pickup. When dealing with varying angles on the face, the bristles do not splay out properly, they seem to move in unison depositing color unevenly. My preferred brush for applying the Lilah B. Bronzer has been the Wawaza Yoshiwara Japanese Makeup Brush $29 USD (here). The compact goat hair bristles are perfect for picking up firmly pressed powders. This brush is also fantastic for contouring, blush, and highlighter application. Unlike other Itabake style brushes on the market (cough, cough Nars), this brush is hand-made in Japan, shipped directly from Japan and does not shed–I digress. 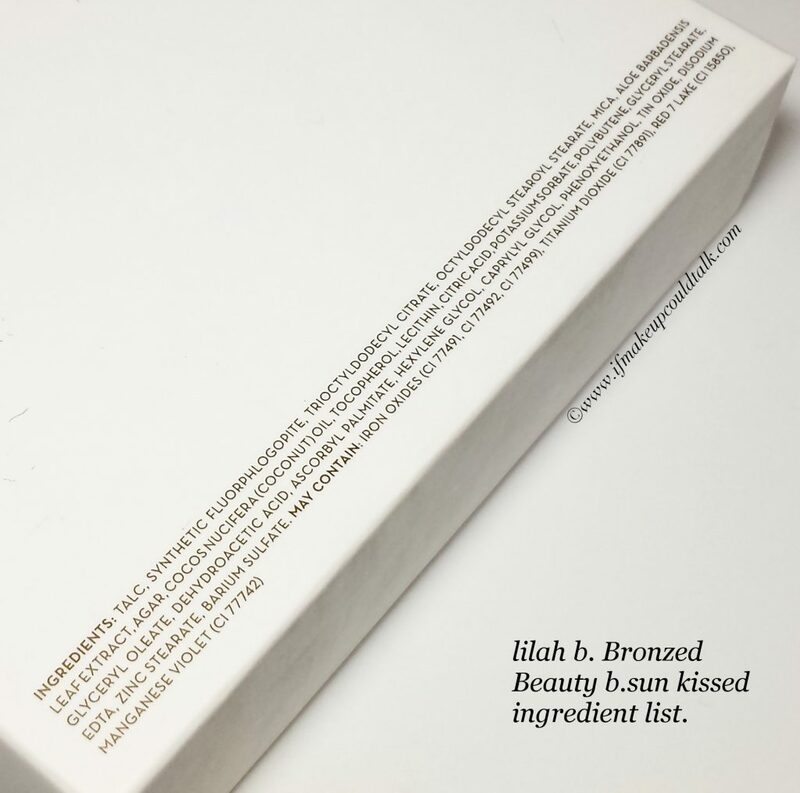 For the price, the packaging of the Lilah B. Brush #2 is not a luxe as the bronzer and concealer compacts. The lightweight material used (perhaps aluminum) feels very similar to my old Sonia Kashuk travel brush, at four times the cost. The retractable aspect is very convenient, but other than that, the rest of the brush is unremarkable and does not command a forty-two ($42) price tag. Wearing the Lilah B. Beauty Bronzer b. sun-kissed as a bronzer and blush. 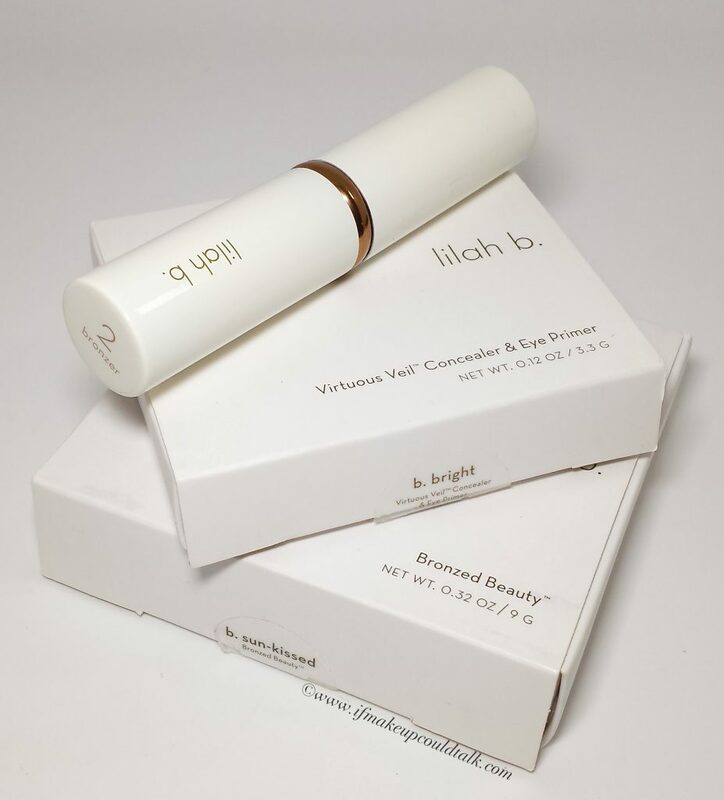 Lilah B. beauty concealer applied under the eyes and used as an eye primer. 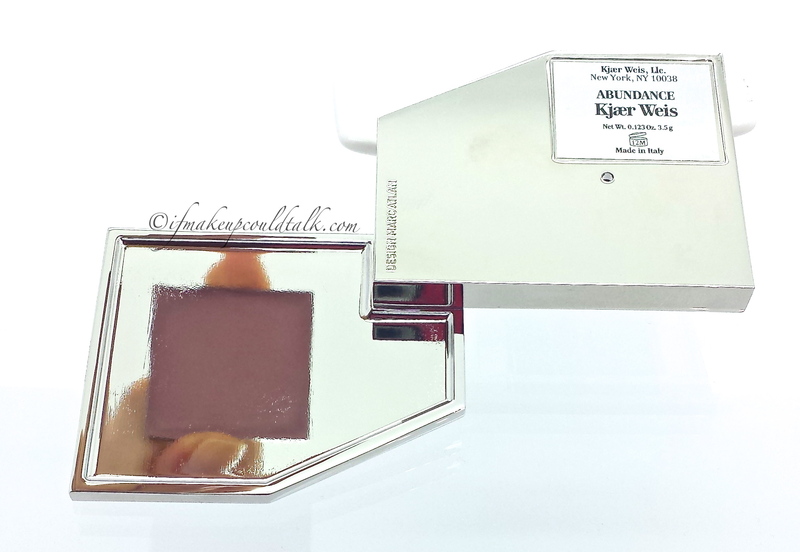 Kjaer Weis Abundance Cream Blush is Abundantly AWESOME!!! The first time I tried Kjaer Weis products I knew I was headed down a dangerous path. Let’s be honest, this is not the most budget-friendly brand on the market. However, I can honestly say, I could let go of over half of my collection and be completely content with using KW products. The amazing packaging, rich texture and natural/organic composition makes this brand a stand-out IMHO. My latest acquisition has solidified my feelings. To quote the Sugar Hill Gang (I’m I revealing my age? 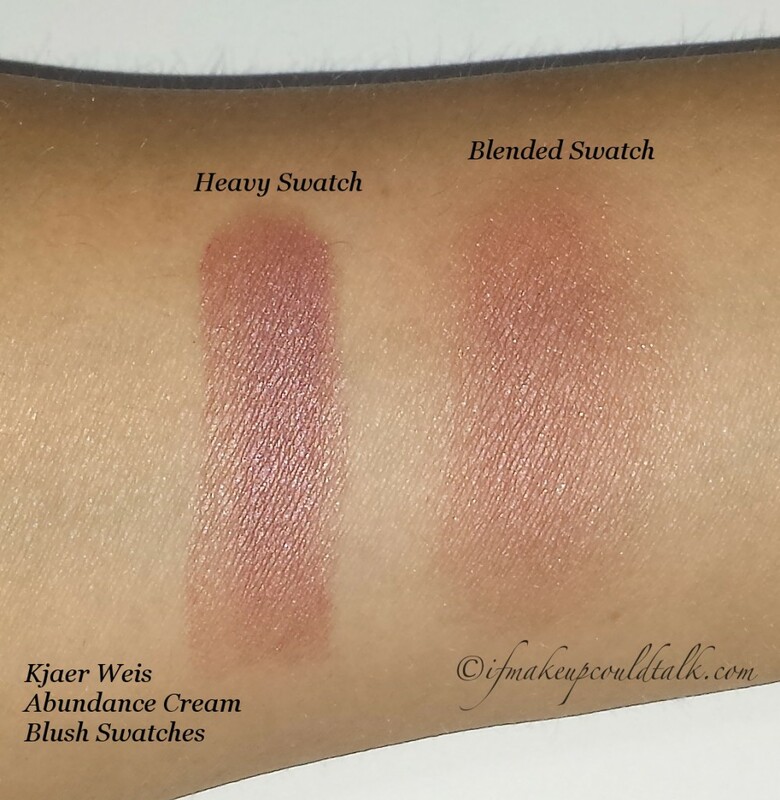 ), “I don’t mean to brag, I don’t mean to boast,” but Kjaer Weis Abundance Cream Blush ($56 USD for compact and blush/$32 USD for blush only) is some seriously awesome toast. 🙂 I hope you enjoy! 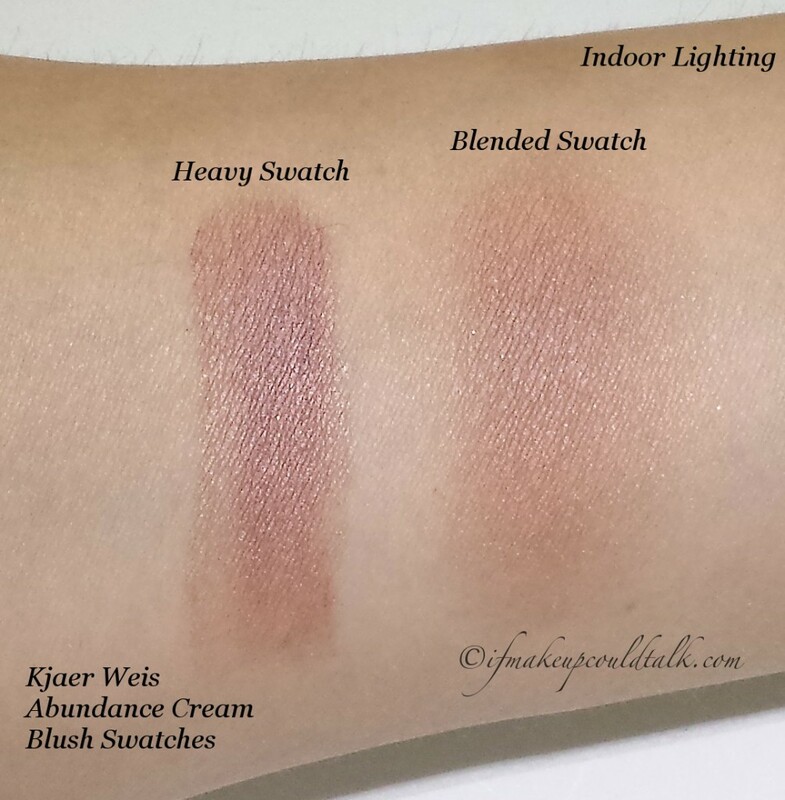 Indoor Lighting: Kjaer Weis Abundance Cream Blush. Photo taken with Flash: Kjaer Weis Abundance Cream Blush. Abundance is described as a “plummy taupe with an iridescent finish.” This is pretty much exactly what I see when I look at Abundance in the pan. However, on my skin, the color morphs more into a deep rose bronze with a subtle satiny glow. The formula seamlessly glides over skin and becomes one with the skin, similar in finish to an airbrush application…Gorgeous! 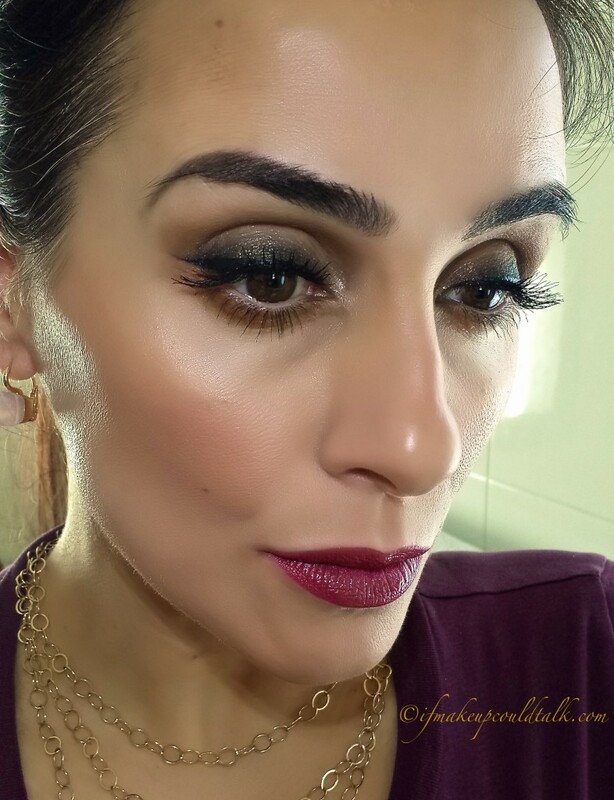 Kjaer Weis Abundance Cream Blush used as an eyeshadow with black liner. 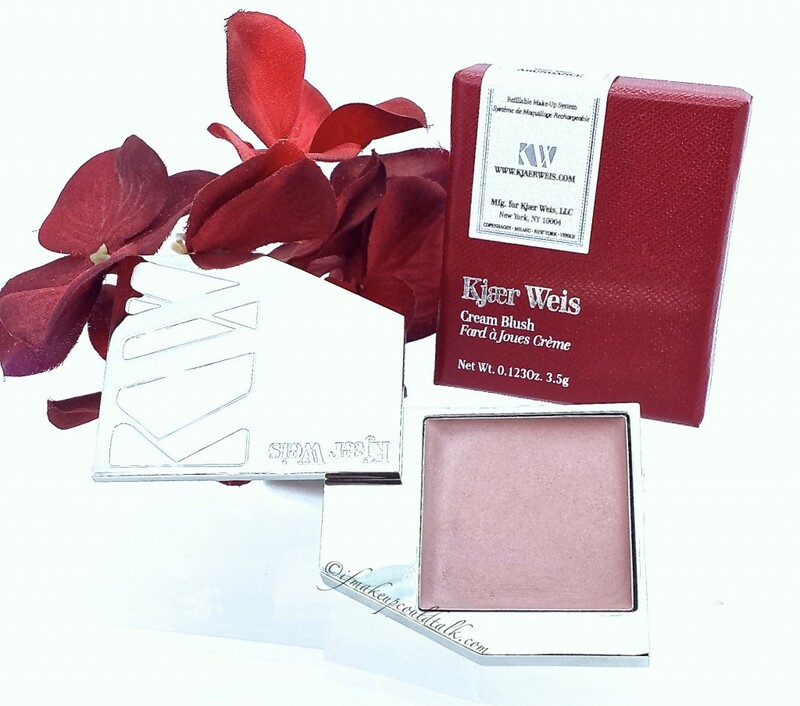 Kjaer Weis Abundance Cream Blush used as a blush and eyeshadow, with KW Radiance Highlighter. As with all Kjaer Weis products, the natural/organic ingredients makes this offering suitable to be used on the eyes, face and lips. 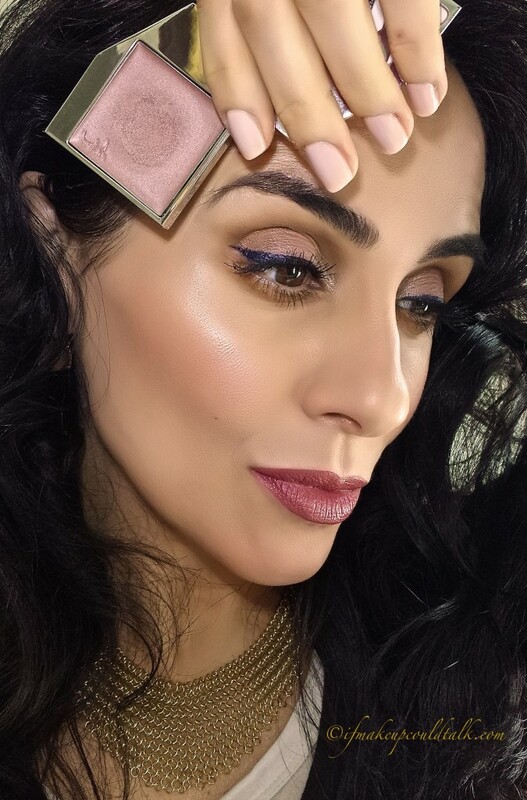 For the above photos (in my best Vogue position possible), Abundance was utilized as a blush and eyeshadow. Over my excessively dry skin, Abundance Cream Blush lasted perfectly for 8 hours with slight fading thereafter. On the lids, the color remained in full bloom all day (over a primer) without any fading or creasing. For the purpose of this post, I reapplied Abundance in the late evening, just to see how well the formula would apply over an existing layer. I am pleased to announce, not only was the application effortless, but the overall results were smooth and seamless. My preferred “tools” of choice to apply this product are my fingers. Even though the consistency is ridiculously creamy and light, I find the natural warmth of fingers pick-up just right amount of pigment, and help blend the color on the skin beautifully. In addition, when paired with Kjaer Weis Radiance Highlighter (reviewed here), the effect was natural and luminous. Kjaer Weis Abundance Cream Blush with Kjaer Weis Radiance Highlighter. For the above photo, Abundance was paired with a more dramatic makeup look–hence substantiating the versatility of this gem. Light-medium/medium skins can easily sport this color with any look. KW recommends darker skins use Abundance as a highlighter. Kjaer Weis Abundance Cream Blush ingredent list. 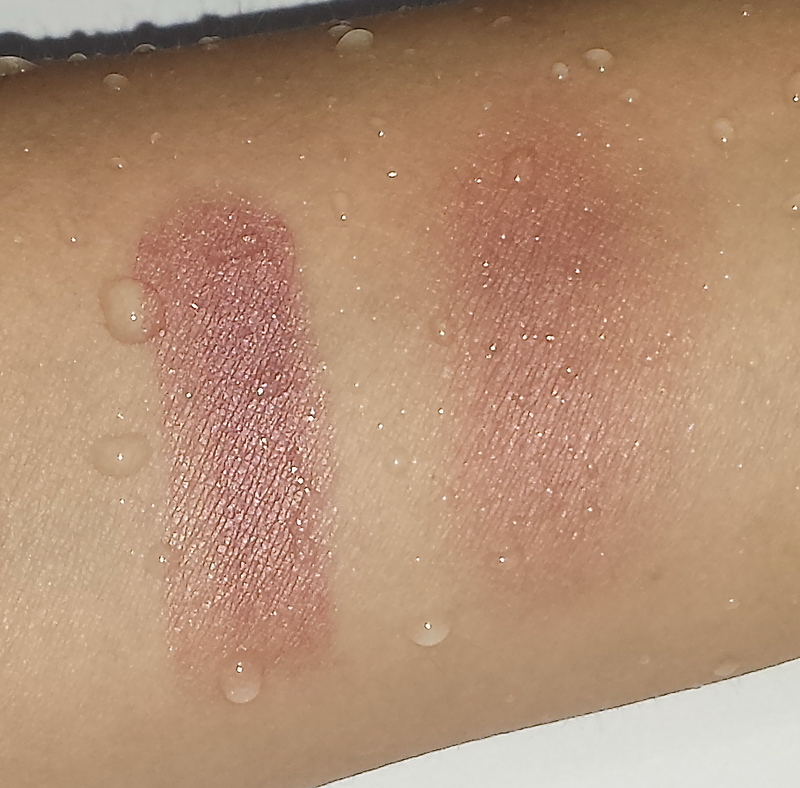 Kjaer Weis Abundance Cream Blush under warm running water for 2.5 minutes. This packaging sends me. The heft, refillable design, finish, and magnetic swivel opening are all top-notch as stated in my previous reviews. 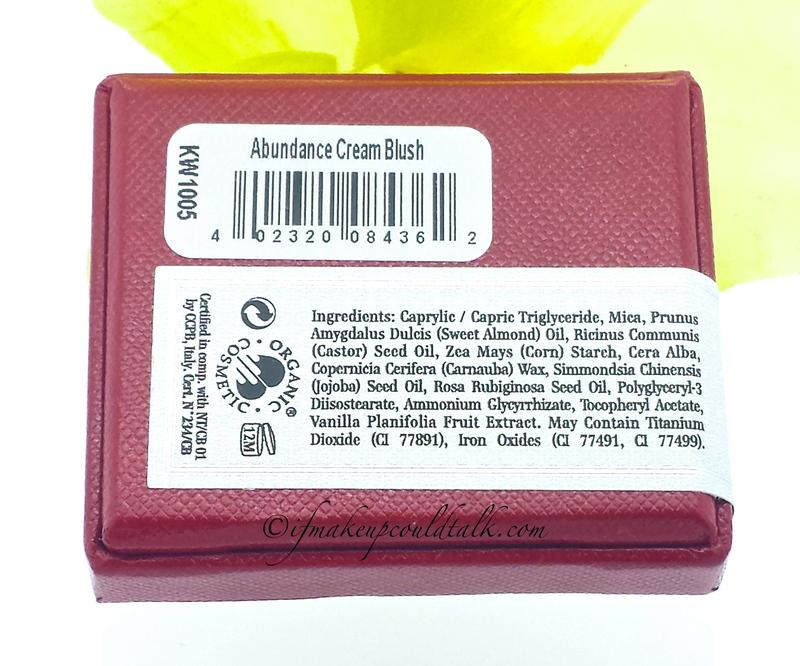 Abundance Cream Blush is composed of 95% organic ingredients, no artificial/harmful chemicals, no animal testing and Italian-made. Does it get any better? As a final note, notice how impressive Abundance held-up under warm running water for 2½ minutes–all the while remaining vibrant and intact. Gaia from The Non-Blonde (here). Taylor from My Lucite Dreams (here). Makeup would tell you Kjaer Weis Abundance Cream Blush is one of my favorite cream blushes. Admittedly, the organic composition is what makes this line so incredibly appealing, but the amazing performance and colors are what keep me coming back for more. Similar to Sugarhill Gang’s Rapper’s Delight, this blush is f-l-y. 🙂 Until next time, be well stay safe and be happy. For your sensory pleasure, grab a special someone and get down to one of the best songs ever penned–Word, you know it. *Ifmakeupcouldtalk.com is not affiliated with any brands mentioned, all products were purchased by me. *Compensation is not given for any reviews. *Click on each photo to enlarge. *Click on the rose highlighted words to take you to a direct link to each product. *All opinions are my own and based on my experiences. *All photos are property of Ifmakeupcouldtalk.com unless otherwise noted. SugarHill Gang Rapper’s Delight video is courtesy of UniversalIndependent on Youtube.